Back in September 2014, we were three years into our cloud cadence. And we were still running our testing the way we had tested before moving to the cloud. We were trying to do things faster, we were trying to optimize our automation, but we were struggling. Our tests took too long. We had a test suite called NAR, which stands for Nightly Automation Run. That took 22 hours. And it’s interesting we had a test suite called “Nightly Automation Run”. By definition we were telling engineers to create tests that took all night to run! And we had another test suite called FAR, Full Automation Run, and that took two days to run. In retrospect it looks absurd that we would name test suites that way, but that’s what we had. Test failed frequently. We could never get a run that passed without significant number of failures. Sifting through the failures was so time-consuming that teams mostly ignored the failures until we reached end of sprint. In retrospect we probably never had a full test run of the product that achieved 100% pass rate on the first go. We focused on driving reliability of our P0 run – about a few dozen integration style tests. Getting those to pass consistently was a pain. We would run them in a tight loop and count how often they passed 100%. If they failed, we’d file a P0 bug and push the team to fix it. With concerted efforts, we could only get them to pass 100% only about 70% of the time. They would fail in variety of ways: infrastructure, product issues, flakiness in the tests. We couldn’t trust the quality signal coming out of the Master branch. An engineer would commit code changes to master, then 12 hours later get the first quality signal with a bunch of failures. It took a long time to sift through those failures. So the team often ignored the failures until we reached the end of the sprint. From there it was a huge cliff to get to the release quality. Sometimes it took us three more weeks just to get to that point. It became clear we needed a completely new approach. 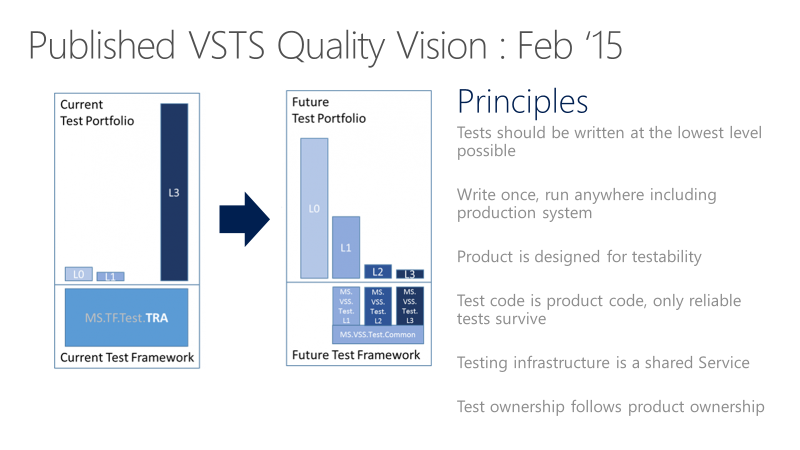 In Feb 2015 we came out with the new Azure DevOps Quality vision document. The core part of the vision was turning the entire test portfolio on its head. We drew this conceptual picture of what we wanted our test portfolio to look like. The y-axis has no real numbers but was drawn to scale to illustrate the point. L0, L1s are the unit tests and the L2, L3s are the functional tests. We came out with a set of principles that the team would adhere to. These are fairly self-explanatory. This is a way of saying that we will favor tests with the fewest external dependencies over all other types of tests. We want the majority of our tests in the future to run as part of the build. Think of a parallel build system that could run unit tests for an assembly as soon as that assembly and an associated test assembly drop. We clearly cannot test every aspect of a service at this level but the principle we need to keep in mind is that we should never choose to test something with a functional test (L2/L3) where a unit test (L0) could have given us the same information. A large number of the tests in our test portfolio then used server Object Model. There were many reasons for this including a lack of testability in the product. This is a practice that needed to end for a few different reasons. Tests written to the server OM depend on internal knowledge and are exposed to implementation details that often do not matter from a functional test perspective. It also pins the tests to environments where the secrets and configuration information necessary to run those tests is available. That generally excludes all of our functional tests from being run against production deployments. Another way of stating this principle is that functional tests (L2/L3) should only use the public API of the product. One of the key opportunities we have under the combined engineering model is to do a better job of taking a complete view of what it means to deliver a quality product on a cloud cadence. 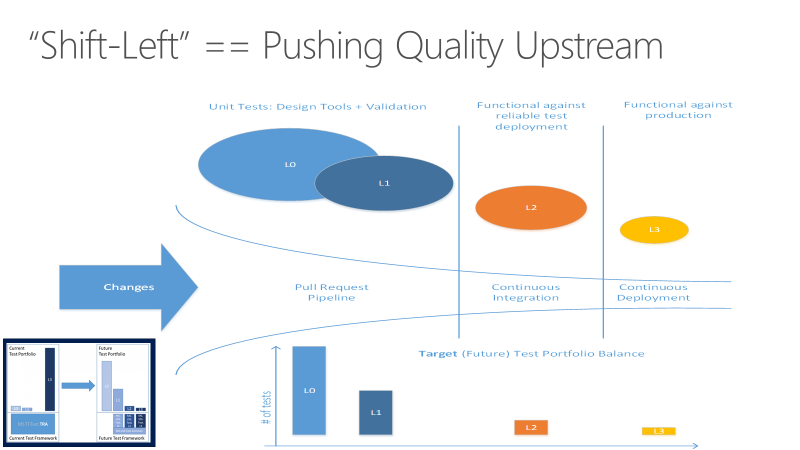 Shifting the balance strongly in favor of unit testing (L0) over functional testing (L2/L3) requires us to make design and implementation choices that support testability. There are different schools of thought about exactly what constitutes well-designed and well-implemented code from a testability perspective – just as there are different perspectives on coding style. The principle to keep clearly in mind is that design for testability must become a first class part of the discussion about design and code quality throughout the team. This speaks to the mindset that we treat test code just the same way we treat our product code. We sometimes say “config is code” to express the importance of having sound engineering practices in place to manage configuration data. Explicitly stating the principle that test code is product code is a way of saying that the quality level of this body of code is as important to shipping as our product code. We must apply the same level of care in the design and implementation of tests and our test frameworks. A code review that does not consider the test code or hold it to the same quality bar is not complete. An unreliable test is an organizationally expensive thing to maintain. It works directly against the engineering efficiency goal by making it hard to make changes with confidence. We want to land in a place where engineers can make changes anywhere and can quickly gain a high degree of confidence that nothing has been broken. We must maintain a very high bar for reliability. We will discourage the use of UI tests. Our experience is that UI tests are generally unreliable as a class. We must lower the bar for using our test infrastructure to generate quality signals we can trust. Unit test (L0) code should live alongside product code and should be built with the product. We ultimately want those tests to run as part of the build process. Those tests must also run under the Visual Studio Team Explorer. Testing is a shared service for the entire team. It’s very well supported. It will have the same reliability as the product code. And the last point is that the test ownership follows product ownership. In other words, the test sits right next to the product code. If you have a component that is tested at that component boundary, you do not rely on somebody else to test your component. We push the accountability to the person who is writing the code. This is another view of the quality vision seen through the pipeline. It shows what it means to shift left and move quality upstream. Most of the testing is completed even before a change is merged into the master. The first issue we had to tackle was convincing the team to start writing more unit tests. Before, the dedicated testers wrote most of the tests. The unit test muscle wasn’t developed. But there was downright skepticism about the strategy. Unit test war broke out. Can the product be really tested this way? We had bad experience with unit tests before – how is this different? Is management going to commit to this vision? You can see the tug of war here where there are people who were extremely skeptical, not only about the approach but also the management commitment behind it. And then there were people who were passionate about this new direction. We had rigorous debate about the type of unit testing that would be allowed, the classical versus mockist approach, in other words unit tests that are completely isolated versus unit tests that take some amount of dependency. For each of these questions, we took fairly pragmatic approach and focused on getting the flywheel going. For example, we pushed for the classical approach where it was possible to refactor the code or it was new code. But when authoring unit tests for the legacy codebase we allowed some dependency. Significant portions of our product code uses SQL and we allowed unit tests to take dependency on the SQL resource provider instead of mocking that layer. We needed new taxonomy. Previous taxonomy was based on duration of the tests, nightly run (NAR), full automation run (FAR), etc. We created new taxonomy that was based on the measure of external dependencies. We roughly divided tests into two categories. L0 – Broad class of fast in-memory unit tests. An L0 test is a unit test to most people. That is a test that depends on code in the assembly under test and nothing else. L1 – A L1 test might require the assembly plus SQL or the file system. L2 – Functional tests run against “testable” service deployment. It is a functional test category that requires a service deployment but may have key service dependencies stubbed out in some way. L3 – This is a restricted class of integration tests that run against production. They require a full product deployment. We have strict guidelines for L0 and L1 unit test. These tests need to be very fast and reliable. 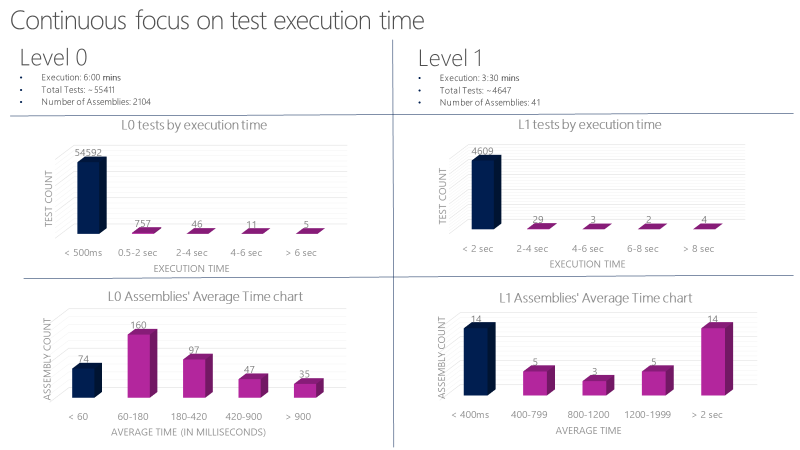 Average execution time per L0 test in an assembly is less than 60 milliseconds. Average execution time per L1 test in an assembly is less than 400 milliseconds and no test can exceed 2 seconds. At present, we can run over 60,000 unit tests in parallel in less than 6 minutes and our goal is to get this down to less than a minute. We track unit test execution time using charts like below and file bugs against tests that exceed the allowed thresholds. The key concept for the L2s is test isolation. Properly isolated tests can be run in any sequence. You can run a properly isolated test in any sequence reliably because it has a complete control over the environment it is being run on. You must have a well-known state at the beginning of the test. If one test creates some data in the database and leaves it lying around, it can corrupt the run of another test which may rely on a different database state. In our old functional tests, if a test needed a user identity, it would call external authentication providers to get an identity. There are a couple of challenges with this. First, there is an external dependency that could be flaky or unavailable momentarily, which can break the test. It violates that test isolation principle because state of that identity (e.g. permission) could be changed by a test, but the next test could expect a different state and fails. To circumvent that we built fake identity support in the core test framework. It was built aligned to the product using extensibility of the core platform. The L2 tests can take advantage of these identities and run the tests in complete isolation. We have been very careful in deciding where we use fakes in the product. The graph below shows our progress, in triweekly sprints. The graph covers sprints 78 – 120. This is 42 sprints or 126 weeks, about two and half years’ worth of effort. We started at 27K legacy tests (in orange) in sprint 78. The legacy tests are at 0 at S120. Most of old functional tests are replaced with a set of unit tests (L0/L1s). Some are replaced with the new L2 tests. And many are simply deleted. Mission accomplished! The new test portfolio looks even better than the one we set out to do with the picture shown earlier. Let’s talk about how we made this journey. We left the old functional tests (“TRA tests”) alone when we started. 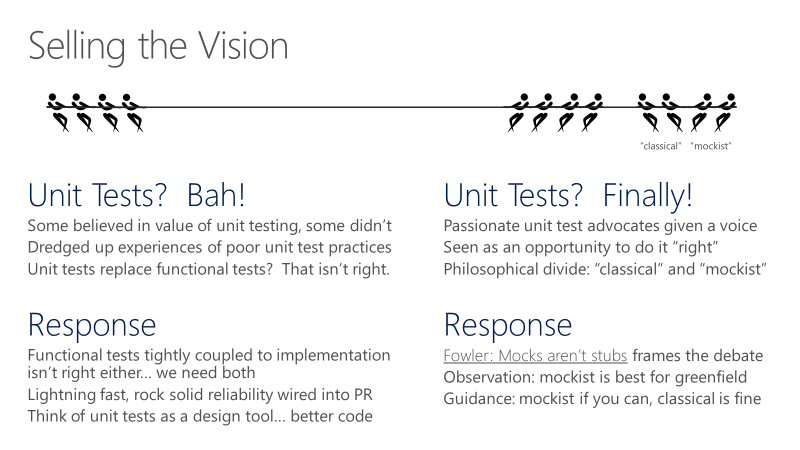 First we wanted to get the team to buy into the idea of writing unit tests, particularly for the new features. We wanted to get the flywheel going. We made it super easy to author the L0 and L1 tests. We wanted to build that muscle first. The graph shows unit test count starting to build up early on. The team started to see the benefit of authoring unit tests. These tests were easier to maintain, they are faster to run, and they had fewer failures. We started running all unit tests in the pull request flow. No, we did not write new TRA tests. We simply discovered more of them in the source tree and added them to this graph! We were running the tests but weren’t tracking them properly. Overall, this effort to completely redo our test system over the past 2+years has been a massive investment. Every single sprint, many feature teams across the org invested time in this. In some sprints it was most of what a feature team did. Not every team did the work at the same time. We don’t know the total cost of doing this was, but we couldn’t go where we are trying to go with the business without doing it. So in the long term it was worth it. The key takeaway here is that once you have a Continuous Integration signal that is extremely fast and reliable, you can trust your CI signal. 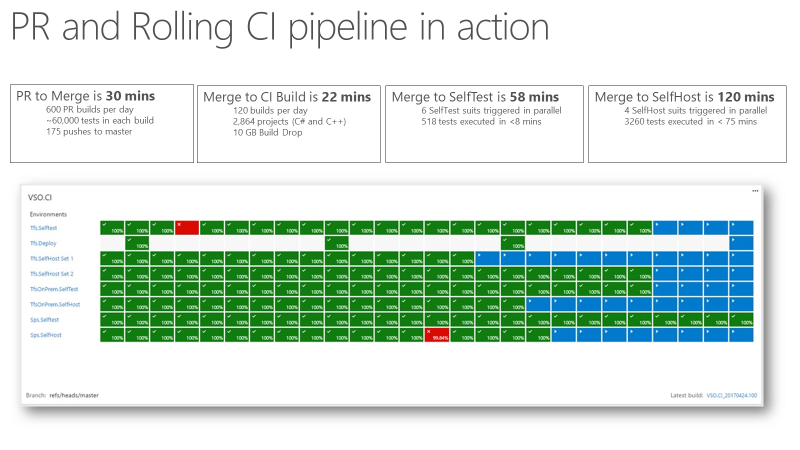 The picture below shows our PR and CI pipeline in action and the time it takes to go through various phases. Pull Request to Merge takes about 30 minutes. We run about 60,000 unit tests in the Pull Request. From code merge to CI build is about 22 minutes. The first quality signal from CI (SelfTest) is about an hour. By that time most of the product is tested with that change. Within 2 hours (Merge to SelfHost), the entire product is tested and the change is ready to go into production. This is what our team scorecard looks like. At a high level, we track two types of metrics: Live site and engineering health (or debt), and engineering velocity. In case of live site, we are interested in our time to detect, time to mitigate, and how many repair items a team is carrying. A repair item is the work the team identifies as part of live site retrospective to prevent similar class of incidents from happening again. We track that the teams are closing those repair items within a reasonable amount of time. For engineering health, we cap active bugs per engineer. If a team has more than 5 bugs per engineer, they need to prioritize fixing those bugs ahead of new feature development. 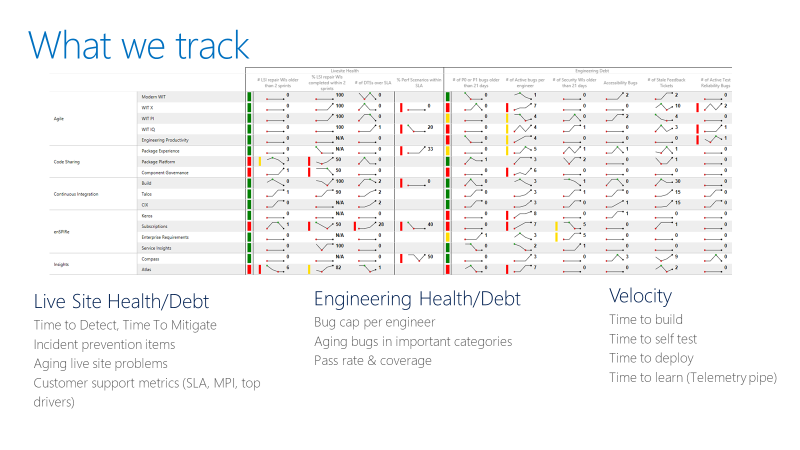 We also track aging bugs in special categories like security. For engineering velocity, we measure speed in different parts of the CI/CD pipeline, with the overall goal of increasing the velocity of starting from an idea to getting the code out into production and getting data back from the customers.